Hammocks of the finest quality from the UK's original hammock company. Producing superb handmade hammocks for more than a third of a century. Our hammocks are unique and are handmade exclusively for us on special wooden looms made to our own exacting specifications. They represent the cream of the hammock world and are not the same as Mexican style hammocks available through other websites. Not only hammocks: we also have hammock stands & fixings, hammock chairs, handmade tiles, baskets, blankets, ponchos, ceramics, tin decorations, Mexican wrestling masks, tile coasters and more. Check out our full catalogue using the site menu or via the panels below. We offer fast delivery and a gift wrapping service. See the options available on the basket page. Spreader bar or not ? How could I hang one? The Mexican Hammock Company works in conjunction with the rural people of southern Mexico to bring you the finest quality handwoven hammocks currently available. The company provides an outlet for hammocks produced by local craftspeople and assists in their struggle towards an improved quality of life through self-motivated development. Our hammocks are made with loving care by Mayan craftspeople following a hammock weaving tradition which stretches back over 4000 years. The skills needed to create our Mexican hammocks have been passed down through many generations and the basic design and weaving method has not changed for centuries. 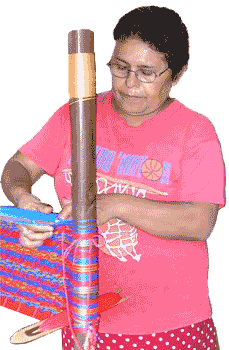 The weaving of Mexican hammocks is not a wholly commercial affair but also an integral part of Mayan culture. Each of our hammocks comes with a handy free weatherproof backpack. We also supply an illustrated Hammock Handbook containing detailed information on hammock use, hammock care and maintenance, washing, hanging methods and much more. Compare the prices of our hammocks to other types of furniture and consider the huge advantages that a Mexican hammock can bring. The Mexican Hammock Company was established in 1983 to provide an outlet in Europe for co-operative based groups in rural Mexico producing handwoven mayan hammocks. The company was set up as a joint venture between ourselves in the UK and a small group of hammock weavers in southern Mexico with the specific aim of developing reliable, alternative sources of income in areas of high unemployment and relative poverty. Hammocks are now a community lifeline towards a better future in each of the villages that we work with.